View More In Plate Casters. 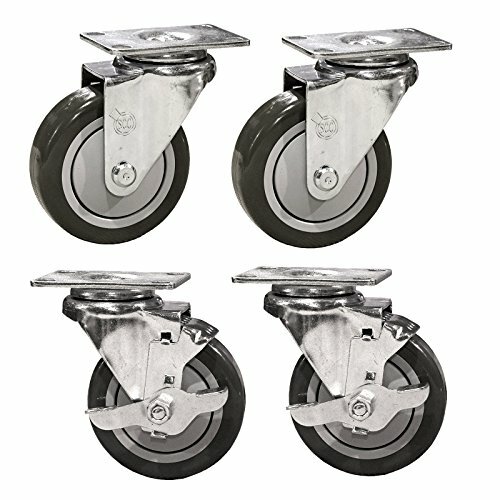 Listing is for set of four (4) service caster Stainless steel swivel casters fitted with 4 inch diameter by 1.25 inch wide polyurethane tread on polyolefin core wheel provide a washable caster solution. Two (2) casters feature top lock brake with foot activated side pedal. Quality light/medium duty casters with fully heat-treated raceways, bright Zinc plating, and ½" precision kingpins built in our berks county, PA facility. A perfect match for dollies and stocking carts. Well-suited for food service, office equipment, and computer room equipment. More applications for this model: Laboratory and institutional equipment, kiosks, mail carts, library carts, welding carts, road cases, and service carts. Wheels roll smoothly with integrated ball bearing design. The polyurethane wheel performs well on most surfaces, and excels on hard surfaces like concrete, Tile, and wood. They will not mark or mar floor surfaces.